Some more information about the What, Who and Why of Manula.com. Manula is software for creating, maintaining and publishing online manuals. It can be used to create any type of manual, user guide or handbook. Our clients use it for software manuals, user guide for electronics, employee handbooks, etc... Created manuals are instantly online, either public or password protected, and included an optional download link for a PDF version. The development of the Manula system started early 2012 and the product was launched in February 2013. Currently, well over 250 companies are subscribed to one of Manula's paid plans. For full details and screen shots, visit the home of this website. Who are the people behind Manula.com? Manula is one of the projects of Bitz & Pixelz, the Amsterdam-based software development company founded by Alwin Hoogerdijk. Bitz & Pixelz (B&P) was founded in April 2000, and currently consist of 11 people: 6 developers, 2 support people, 2 content managers and Alwin running it all. The first (and still the biggest) B&P project is Collectorz.com, a series of collection database programs aimed at home users, for cataloging their personal collection of movies, books, music, comics and/or video games. 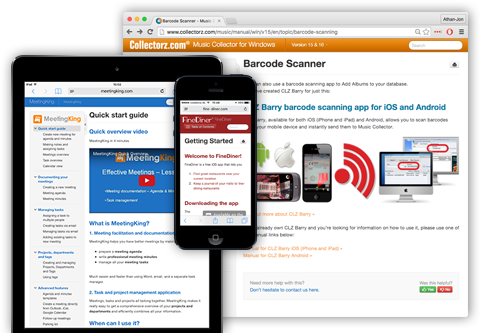 Collectorz.com's software is available online, on Windows, Mac, iOS and Android. PasteAway: a cloud-based clipboard manager aimed at large customer support teams. WatchBase: an online watch database, aiming to catalog the world's high-end mechanical watches. FineDiner: an iPhone app for finding fine-dining restaurants and keeping track of your visits. Manula.com is B&P's second big project, arisen from Collectorz.com's need for online manuals (see below). To legally and financially separate Manula from other B&P products, Manula is run under a separate sub-company for B2B-type products, called Proton 27. Sven Spillekom, one of B&P's senior web-developers, is working on Manula full-time, regularly assisted by web-dev team captain Robbert van Koningsbruggen and junior web-developer Dion Bosschieter. Alwin Hoogerdijk is personally handling all communication with our customers, including all support tickets. This way, Alwin gets direct feedback on how users are using the software, what they're looking for in terms of future features and what problems they run into. A few years ago, we were fed up with the clumsiness of Windows help files included in the installers of our software. If you're a software developer, you know how it goes: your new software version is ready for release and you're eager to get it out there. So bringing the manual up-to-date with your new features often takes a back seat. Sometimes you whip up some new topics quickly, sometimes you just skip that part completely. And then, the software is released, with the less-than-optimal manual included in the installer. So even if you do improve the new topics later, you will have to build and release a new version of your software and installer to get the updated manual in the hands of your users. At Collectorz.com, this awkward process just didn't work anymore and resulted in our manuals always being outdated. So I figured: what if we could maintain and update our manuals without releasing a new version of the software or its' installer? That would let us start with some quick basic topics, then go all-the-way after the software release and even tweak the topic contents based on user feedback. Of course, the obvious solution was to have our manuals online. So I started looking for a tool to create online help files. But not a desktop program that exports to HTML, no, I wanted an online tool, a web-application to create and maintain user guides online. In other words a content management tool for online manuals. And strangely enough, at the time (I am talking early 2009 here) I could find no such thing. Simply dubbed "the CLZ Manual Admin", it started out as a very basic in-house tool, completely focused on our products and the way we like to do things at Collectorz.com, cutting corners where possible. But already including some smart methods for sharing topics between manuals (essential for efficiently maintaining the manuals for 9 different but similar Windows and Mac products). Later, based on feedback from our in-house support guys, we added tracking features to measure topic popularity and thumbs up/down ratings for keeping track of topic quality. Of course, these support guys, who maintain our CLZ manuals, had more ideas for enhancements and new features. But instead of hacking them into the existing tool, we decided to start from scratch and turn this in-house tool into a real product. An application suited for use by other software developers and basically everyone who needs to create and maintain manuals online. Manula was born. Currently, Collectorz.com is still one of the most active Manula "customers", with 19 manuals online. As we're using Manula on an almost daily basis, most of Manula's new features and improvements originate from the minds of our own in-house support team.